To help contribute to the GHS's many ongoing restoration projects, Dino's Market and the three IGA Markets in Pascoag, Slatersville, and Scituate have agreed to donate 1% of totals on receipts turned in for merchandise purchased at their stores. Turn in your receipts to any GHS Member, bring them with you to our next meeting, or drop them off at the Job Armstrong Store. 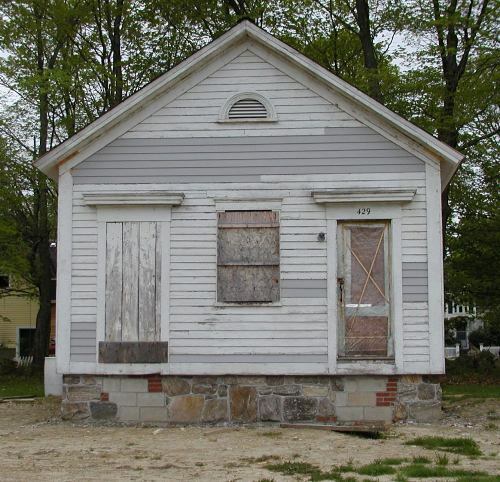 "Relocation of Evans Schoolhouse Approved"
Is that a schoolhouse on the road?" 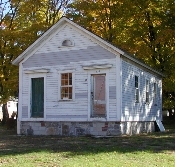 Evans Schoolhouse was built by Daniel Evans on his land about 1867. 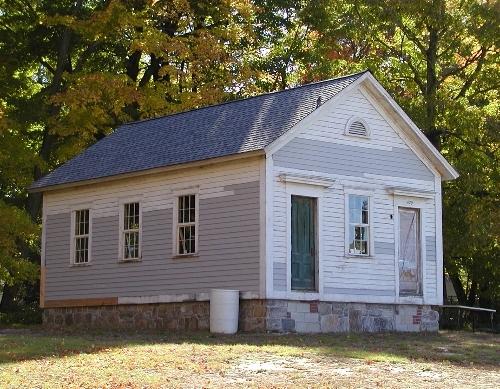 The schoolhouse was located in Glocester District #2, on Evans Road in East Glocester. 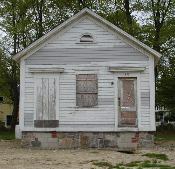 Mr. Evans hired the teachers for the school and provided them with room and board. 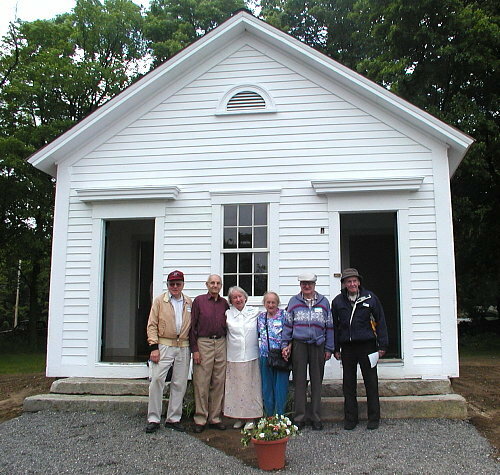 After seventy years of service, the building was returned to the heirs of the original owner. After many years of disuse, the house was moved to land owned by Marcus & Barbara Thompson. In 2000, the first topic on the Glocester Heritage Society's agenda was the Evans School House. With persistence and perseverance, our goal has finally been accomplished. The grant from the Gregson Foundation enabled us to complete our task without straining the very limited finances of the Society. 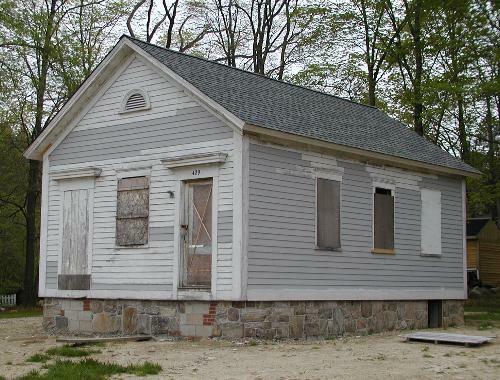 What a wonderful gift to the Town of Glocester! 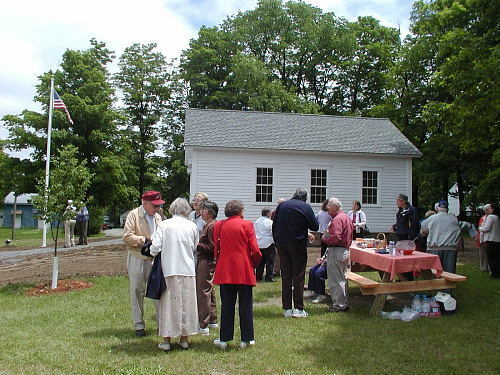 On June 15, 2003 a dedication ceremony was held for the restored Evans School House. 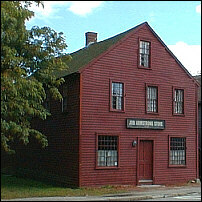 We sincerely hope the citizens and especially the youth of Glocester will enjoy this bit of history. 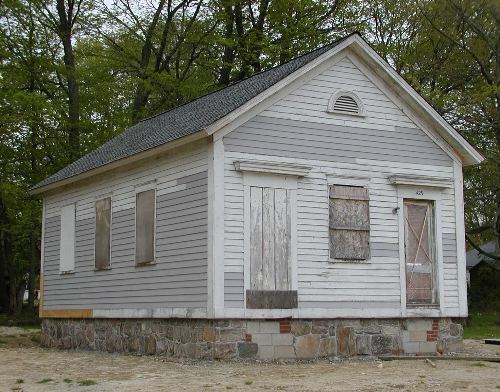 The foundation was faced with fieldstones and siding was applied as time allowed. and walls and ceiling were prepped for plastering. 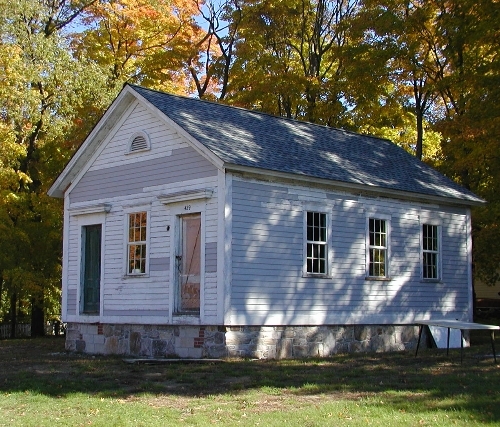 By early June 2003, the interior of the schoolhouse was painted and the floors had been refinished. The exterior sported fresh white paint, granite steps and a gravel walkway. 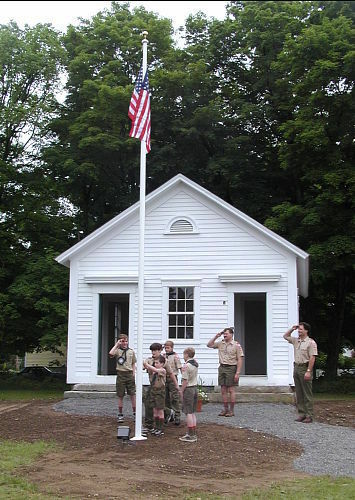 A flagpole was erected in time for the dedication ceremony on June 14th, Flag Day. 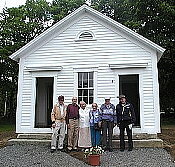 Nearly a hundred people, including six former Evans School House students (at right), attended the festivities. their time, ideas, expertise and enthusiasm towards the successful completion of this project.